Here’s the opportunity to capture that all-important first impression. As attendees arrive they will be directed to the Registration Desk. This is a desirable high traffic location open the entire length of the event. Station your reps at the Desk and greet every planner as they register. The sponsor may brand the area with signage and collateral material. A chance to get in front of the top movers and shakers as you welcome all the XSITE meeting planners. Approximately 35-40 pre-qualified meeting planners! Perfect for a hotel group or CVB. You’ll be able to brand the event, show a video, add your own décor and make a short presentation to the attendees. This is great opportunity to get in front of those interested in advancing their career through the participation in our CMP Bootcamp. The CMP designation signifies the best of the best in the meeting planning profession. You will be able to show a short video, speak for 2 minutes on your organization and introduce our speaker Molly Johnson. During the tradeshow, the Planner Lounge is a hub of activity for all attendees and the place to make connections. It comes with refreshments and snacks. This unique sponsorship allows you to brand the area to promote your product, service or destination. 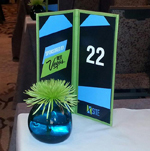 Incorporate your logo into the XSITE Table Number menu jackets providing a strong and complete branding message to all our Planners. Our grandest event and a show-stopper! You will have the opportunity to make a short presentation, show a video, and brand the event as you wish. Do you have a unique item or amenity to promote your brand to our XSITE Planners? Specific shipping instructions and deadlines will apply. Does not include the cost of the item.